GM posted a growth of 4.9% for December 2012 and while that figure put them towards the bottom of the rankings in terms of growth, it was quite a bit better than Ford Motor Company’s growth in the last month of 2012. With 245,733 units sold, GM was easily the top dog in US sales for the month – beating Ford by some 20%. The top brand from GM in terms of growth for December 2012 was Cadillac and while the new ATS and XTS don’t technically have a growth rate of their own since they didn’t exist in December 2011, these two new models had a major part in helping the Cadillac brand be GM’s stronger model in growth for December with a jump of 12.2%. Interestingly, every single Cadillac vehicle that was available one year ago showed negative growth but in the case of many of those models including the STS and the DTS – figures were down because they are no longer available. The Cadillac CTS was down due to the fact that Cadillac buyers are opting for the smaller, sportier ATS or the larger, more luxurious XTS. In terms of sales volume, the Cadillac SRX led the brand with 6,400 units sold followed by the CTS family with a total of 3,372 sedans, coupes and sport wagons sold. Third in overall sales already was the new Cadillac ATS with 2,979 sporty small sedans sold while the range topping XTS was fourth in monthly sales with 2,939 units sold. On the year, Cadillac moved 149,782 new luxury vehicles in the US. This accounts for a decline in sales from the year before of 1.7% which was most likely caused by many prospective buyers waiting for the arrival of the new ATS and XTS. Cadillac was one of just five brands sold in the US to show a decline in annual from 2011 to 2012, joining Lincoln, Jaguar, Suzuki and Mitsubishi. The only vehicle from the Cadillac brand to show positive growth in 2012 was the SRX crossover, which also led the brand in overall sales with 57,485 units sold. 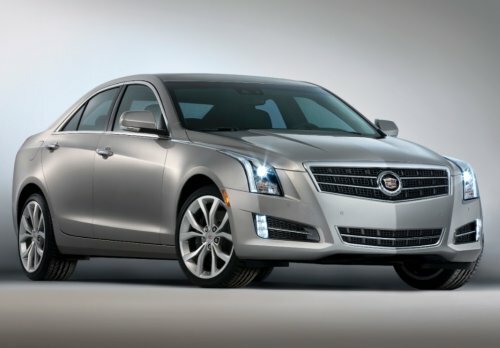 The CTS family was second in sales with 46,979 units sold while the new XTS was a distant third with 15,049 large sedans sold during its short time on sale late in 2012. We can certainly expect to see the ATS and XTS continue to bolster the Cadillac brand’s numbers in 2013. Buick was second among the GM brands in terms of December 2012 growth with a 10% increase and, as is the case with Cadillac, Buick is benefitting greatly from a newer model. While GM is considering the Buick Verano “new” so the company isn’t listing a growth rate, having gone from 261 units in December 2011 to 4,820 units in the same month in 2012, the Verano posted a growth of over 1,700% (although I should point out that Dec 2011 was only the second month for Verano sales). The Buick Enclave also pitched in with a growth of 8.9% while the LaCrosse and Regal both posted declines in sales. In terms of sales volume, the Enclave was the top Buick model with 6,052 SUVs sold followed by the Verano with 4,820 units sold and the LaCrosse was third with 4,074 sedans sold. For the 2012 calendar year, Buick sold a total of 180,408 vehicles which accounted for an increase of 1.6% for the year. The Verano was the only model from the Buick brand to show a positive growth in 2012 jumping from 265 units in 2011 to 41,042 units in 2012 – a figure which made the compact Verano the brand’s third best model in sales volume. The top model in annual Buick sales was the LaCrosse with 57,076 sedans sold followed by the Enclave with 56,703 large SUVs sold in 2012. Buick should benefit from the addition of the new Encore compact SUV along with the continued growth of the Verano with the addition of the more powerful Turbo model. GMC ranked third in sales growth for December 2012 with an increase of 4.7% in selling 43,921 trucks, vans and SUVs. GMC’s top model in terms of growth was the Terrain compact SUV with a jump of 49.1% followed by the Sierra pickup with an increase of 13.4% while the rest of the available GMC models posted a negative growth in December. The top model in terms of sales volume was the Sierra pickup with 18,710 trucks sold followed by the Terrain (11,516) and the Acadia (5,179). On the year, GMC moved 413,881 new units and that accounted for an increase of 4% compared to the year before. The Savana van was the top model overall for the year in growth with a jump of 19.6% followed by the Terrain, which improved by 17.6%. The popular Sierra pickup family came in third in growth with a rate of 5.4% while also pulling down the title of being the brand’s bestselling model with 157,185 new trucks sold. The Terrain was second in annual sales with 97,786 compact SUVs sold and the large Acadia was third with 78,280 units sold last year. The 2013 model year should bring about some growth for GMC with the new Sierra pickup, if nowhere else. Chevrolet may have been the “worst” from GM in terms of December 2012 sales growth with an increase of only 3.7% but with 167,091 units sold last month, Chevy was the company’s top brand in terms of sales while also ranking second overall behind only Ford. The top model from Chevrolet in terms of growth among the non-commercial models was once again the electric Chevy Volt with a jump of 72.2%. The Cruze was second in growth with an increase of 27.3% while the Corvette was third with an improvement of 24.4% - most likely caused by people snatching up the last of the 6th generation Corvette ahead of the debut of the 2014 Corvette this weekend. In terms of sales volume, Chevrolet was led by the Silverado as usual with 50,699 new trucks sold while the Cruze was second (21,230 sold) and the Equinox (19,551 sold). For 2012, Chevrolet was GM’s bestselling brand while also being America’s second bestselling brand with 1,851,646 units sold – an increase of 4.3% over 2011. The Chevy Sonic was the top non-commercial model in terms of growth with a jump of 414.9% followed by the Chevy Volt with an impressive increase of 205.8%. The Avalanche pickup was third in growth with a rate of 19.4%. In terms of sales volume, the Chevy Silverado was the top model from Chevrolet with 418,312 units sold, a figure that makes the Silverado the second bestselling model in the US behind only the Ford F Series. The Chevy Cruze was second in sales with 237,758 units sold while the Equinox grabbed the third spot with 218,621 small SUVs sold in 2012. 2012 was a tumultuous year for General Motors with both very good months and very bad months (although nothing near as bad as the figures we saw in 2008-2009). At the end of the year, General Motors showed positive overall growth of 3.7% which is a good thing but the bad news is that their growth was the lowest among automaker groups doing business in the US. However, being the slowest grower in the industry didn’t prevent GM from once again claiming the title of being the bestselling automaker in the US with 2,595,717 new vehicles sold last year. That is about 345,000 units better than Ford Motor Company and roughly 510,000 more than Toyota Motor Co. Thanks to new models like the Cadillac ATS and XTS, the Chevrolet Volt, the Buick Verano and the continued growth of compact models like the Chevy Spark, Sonic and Cruze – GM stands a good chance of holding onto their title for the 2013 calendar year. GM posted a pretty significant win in sales this year and while Ford and Toyota posted stronger growth in 2012, they will both need to really improve sales in 2013 to catch GM.